Formosa Biomedical Inc. was founded in 1950. It is the earliest animal vaccine company in Taiwan as well as the biggest one in Southeast Asia. For many years, FBI has played an extremely important role on animal quarantine system of Taiwan animal husbandry. We produce many kinds of swine and poultry vaccines with factory having GMP qualification. Our vaccines are being supported and used widely in animal husbandry because of the stable quality and reasonable price. The outbreak of FMD in Taiwan on March, 1997 and the policy of joining WTO struck Taiwanese swine industry more seriously than ever. Moreover, an outbreak of avian influenza occurred in Taiwan in 2004, this outbreak gave a heavier stroke once again to the weaker animal husbandry. Contrary to other companies that declined or withdrew from the livestock industry, FBI made more effort on personnel training and investment on R&D department. We also actively improved the quality of our products at this time. So far we have technology cooperation with Japan KYOTO BIKEN Laboratories, Inc., some college research departments and other companies. Since Taiwan is going to step into the international environment in which economic system will have fewer barriers in the future, FBI pays more attention to expand overseas market based on domestic leading position. We have been successfully selling our products to Japan, EU and ASEAN in recent years. Our current production line is unable to satisfy the demand from local market and growing international export market. Now we plan to set up more automatic production equipment for lowering the cost of production and enhancing our competition capability. FBI’s main target on this stage is to expand productivity, enhance R&D capability and stably offer products of the highest quality. Lay stress on constant advances and business continuity of this company. Help the growth of agriculture biotechnology industry in Taiwan. Promote economics and benefit of animal husbandry in Taiwan. Training of professionals in production of animal vaccines. Creating job opportunities in the field biotechnology in the coming century. Adopting modern techniques from international sources and exploring international markets of our products. Consult experts from the industrial, governmental and academic segments to determine the direction for operation of FBI. Transfer new manufacturing technology from developed countries (Japan and USA). Promote the cooperation with research units in Universities of Taiwan to develop new products with high competition capability. Recruit staff members with specialty in biotechnology-related science to enhance the quality of manufacturing and human resource. Sell products with FBI brand to the overseas market. FBI has successfully sold our products to the market of Japan, Europe, Thailand and Philippines. The next market will be countries of ASEAN and China. FBI is the biggest animal vaccine manufacturer in Taiwan which consists of 60 staff members. There are six departments in FBI, namely, business, finance, general affairs, production, QC and R&D departments. 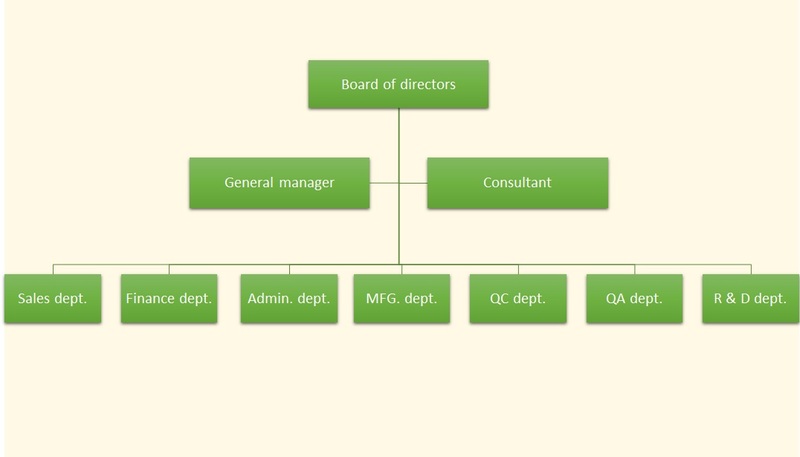 All the departments are conducted by CEO. Following is brief description of each department. Divided into national and international divisions. National division is in charge of distribution business and after-sale service around 16 counties in Taiwan. International division is in charge of export connections with Europe, Japan, and Southeast Asia. International division also manages FBI products registration in foreign countries. Managing financial and accounting affairs. Coping with administrative services, personnel management, shipping arrangement and so on. Divided into 5 sections, including three sections of viral vaccine, one bacterial vaccine section, and one packaging section. They are responsible for production of 48 items of FBI’s animal vaccines. Divided into biological test section and chemical test section. They are responsible for inspecting raw materials, semi-finished products and finished products in each procedure of production. All products need to be passed QC examination before sending to national test. After acquiring the government certification, FBI is able to sell qualified products. Taking charge of improving internal production process, developing new products, receiving and carrying on technology transfer project, examining finished products of mass production and organizing all the products registration data. Installed and commissioned the first freeze-dryer imported from Japan. It was the first freeze-dryer in Taiwan and started to production of freeze-dried lapinized hog cholera live vaccine and other freeze-dried live vaccines. Certified as a GMP facility by the Ministry of Economic Affairs of Taiwan. Signed technology cooperation contract with KYOTO BIKEN Laboratories Inc., and was officially ratified by the Taiwan government to produce the first batch of Hog-Cholera tissue culture live vaccines the next year. Planned the construction of Beidou new plant. Began to construct Beidou new plant in 1993 and relocated in 1997 to the new factory area. This plant was accredited and certified GMP by the Taiwan government at the same year. The whole land area at this site is 25,917 square meters (m2) with the total building area of 11,580 m2 which includes the production building land area 3160 m2; the office building land area 562 m2; the dormitory and restaurant building land area 330 m2; the material warehouse building land area 330 m2; and the animal test facility building land area 794 m2. The company was renamed as “Formosa Biomedical Inc.” (F.B.I. ), the present name. Introduced Enterprise Resource Planning system (ERP), turning into enterprise computerization. Signed a joint research and development contract on “Agriculture Biotechnology Development Project” with the Development of Veterinary Science, Taiwan University and the Department of Medicine, Taipei Medical University. Installed and commissioned a high volume freeze-dryer of 32,000 vials capacity and automatic live virus divided equipment from Virtis, USA. Signed the technology transfer contract on “Pasteurella Multocida Inactivated Subunit vaccine” with National Chung Hsing University. Signed the technology transfer contract on “TW I avian Infectious Bronchitis Living vaccine” technology transfer with National Taiwan University.